The Islamic State has claimed the attacks on two Coptic churches in Egypt that were packed with Palm Sunday worshippers, killing at least 37 people and wounding dozens of others, officials said. Egypt's Health Ministry says an explosion at a church in the coastal city of Alexandria has killed 11 people and wounded at least 35 others. 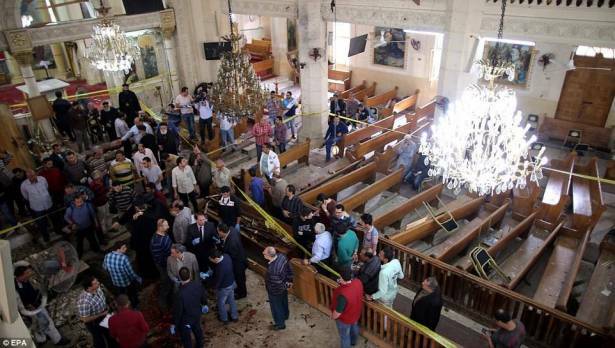 It appeared to be the second attack targeting Egypt's Coptic Christians after a bomb in a church in the Nile Delta town of Tanta killed 26 people and wounded more than 70. The attack in the Nile Delta town of Tanta was the latest in a series of assaults on Egypt's Christian minority, which makes up around 10 percent of the population and has been repeatedly targeted by Islamic extremists. It comes just weeks before Pope Francis is due to visit the Arab world's most populous country. CBC TV showed footage from inside the Mar Girgis church, where a large number of people gathered around what appeared to be lifeless, bloody bodies covered with papers. Regional Deputy Health Minister Mohammed Sharshar confirmed the toll.